AMMONNEWS - His Majesty King Abdullah, accompanied by His Royal Highness Crown Prince Al Hussein bin Abdullah II, received on Monday Prime Minister of Kuwait Sheikh Jaber Al Mubarak Al Hamad Al Sabah, who is heading a high-level delegation of ministers, businesspeople, and private sector leaders on a visit to Jordan. 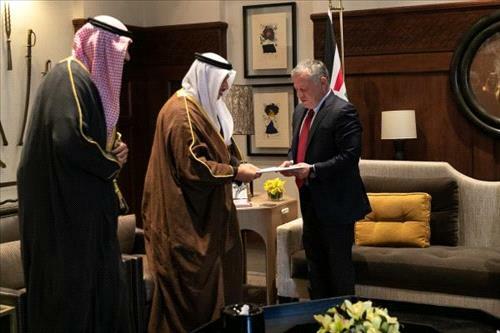 Sheikh Jaber delivered a letter to King Abdullah from Emir of Kuwait Sheikh Sabah Al Ahmad Al Jaber Al Sabah, which focused on the historical ties between Jordan and Kuwait, as well as keenness to advance them further. During a bilateral meeting at Al Husseiniya Palace, which was followed by an expanded one attended by Prime Minister Omar Razzaz and senior officials on both sides, discussions covered opportunities for economic, investment, trade, and military cooperation. His Majesty stressed the importance of the fourth round of meetings for the joint Jordanian-Kuwaiti higher committee, held in Amman on Monday, noting the agreements resulting from it. In addition, discussions covered the international conference hosted by the United Kingdom’s government in cooperation with the Jordanian government in London later this month. The importance of stepping up efforts to launch Palestinian-Israeli peace negotiations based on the two-state solution and the Arab Peace Initiative was also stressed, leading to the establishment of an independent Palestinian state on the 4 June 1967 lines with East Jerusalem as its capital.